Of the organizational variety, that is. So, I took the plunge. Okay, maybe dabbled my little toes in. I bought a couple of sturdy, transparent Rubbermaid tubs. I wish I had the funds to buy a jillion more, but I’m hoping if I can buy one each time I’m at the grocery store, I’ll have enough to keep everything in by, oh, Christmas. /sigh. One tub is already full of the fabric that had migrated up to the sewing room* during the wedding sewing. I want enough of those to sort my fabrics by type again—I haven’t had that since before we left Calgary. The second tub, pictured above, is holding patterns. It’s not quite deep enough—a half inch more would be perfect—but I think it will do, at least for the regular-sized envelopes. The contents are sorted, roughly, by company. 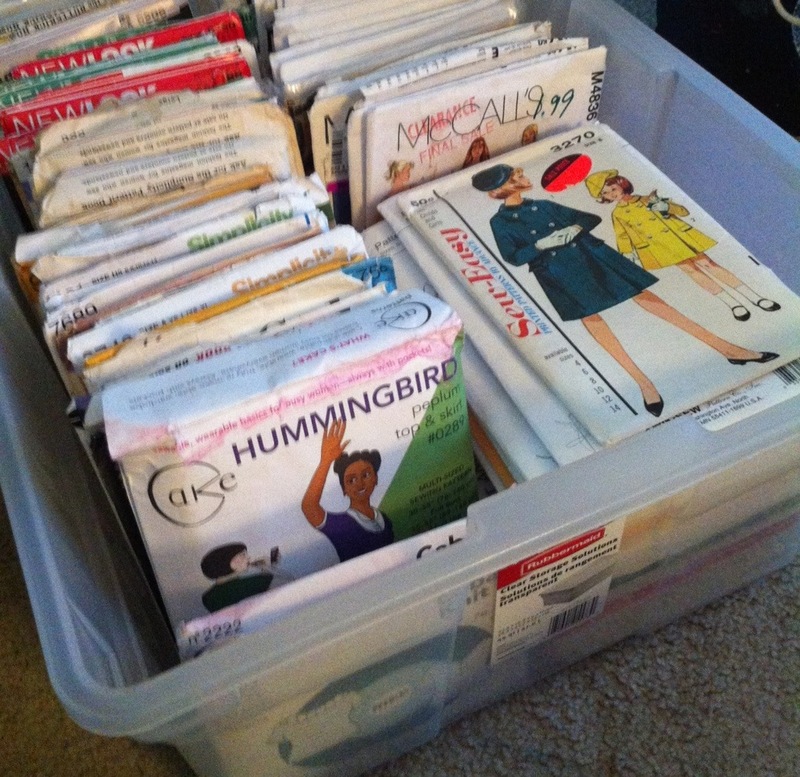 I’m pretty sure I can fill at least two or three more of these tubs just with patterns. My name is Tanit-Isis and I am a pattern-aholic. While sorting patterns, I’ve also been working on transferring my pattern info, which I’ve been tracking in a phone app called Sewing Kit (as reviewed here), into a different app, MyStuff2 (as recommended by several commenters in my review of Sewing Kit). Although Sewing Kit worked fairly well for me for a long time, once I got to about 500 patterns I found it crashed more and more and more. It still has one or two features that MyStuff2 can’t replicate, and MyStuff2 takes some setting up to get the categories and attributes all the way you’d like, but if I can’t use Sewing Kit because it always crashes, it doesn’t do me much good. I don’t have MyStuff2 up to 500 patterns yet, but by all reports it’s a much more reliable program all around (people use it to categorize all kinds of things—it’s actually really awesome for books and movies because you can scan the barcode), so I’m hopeful that all will be well. I’m going to need another shelving unit for sure, but I’m optimistic if I can get the fabric and patterns tubbed up, I can re-organize notions and thread and things into the other plastic-drawer-storage unit I already have and then maybe, just maybe, be able to actually find things. Of course, what I really should be doing is tracking the fabric stash, so I can paw through that digitally… but somehow it’s not as satisfying as tracking the patterns. Of course, assuming I get everything organized, then there’s the task of KEEPING it organized. Which always seems to be the one that defeats me. Aiee. *Formerly the computer room. My husband is not happy about this. Organizing is stinking expensive! I love how all the organizing tips/services make it sound so simple but forget to mention that all the containers cost $$$. And yes, the hardest part is keeping it that way once you do it – I have to “lazy-proof” as much as possible. Too bad my stash keeps trying to escape my sewing room and take over other rooms. I really like pegboard for storing thread/scissors/etc. As a bonus, it’s pretty cheap. I think I bought half a sheet for like $5, plus the can of spray paint to turn it from ugly chipboard brown to white. The downfall is that the pegs can be expensive to buy all willy nilly, so plan carefully which pegs you’ll need (if you want to know which ones I have for what, feel free to ask). And I have some of those plastic tubs (which are overpriced, IMO) too, and I’ve found that as long as I keep the designer Vogue patterns out, most of the others fit OK. I agree, just one thing at a time! I am also happy to know of someone with 500 patterns, I’ve gone over the 500 number, couldn’t believe it when I got it counted! And organized, not cheap at all, I got the Elfa system, and it takes 4 2 ft wide and maybe 24″ deep wire drawers for them! Anyway, I hope hubs saw your talent by those dresses for the wedding you did, and sees you need space! After all, one can use a computer while sitting on the sofa! Continued energy to finish your organizing goes your way all the way from me in Arizona! Ahhh, organising. Personally I quite enjoy it but I know it’s not for everyone (because people keep telling me that). Good luck on your task, I hope it goes well for you! Yes, organizing can be expensive, so I was going to suggest some ways to do it on the cheap. Where I live people actually sometime THROW AWAY plastic storage tubs. so don’t be afraid to rescue them from other people’s trash. (Seriously, you cruise around the neighborhood early on garbage morning and see what you can see. And if your neighborhood isn’t the kind of place where people throw away useful stuff, try the Big Houses neighborhood.) Also, do you have Craig’sList where you are, or some other website where people list stuff for sale (and sometimes for free), like Ebay, but it’s local? Between that and garage sales, you might be able to pick up your storage bins for very little. 500 patterns?! You need an intervention. Or I could take a few. 🙂 BTW, would the bride for whom you have done so much work be willing or able to gift you some organization supplies (after all, they may benefit her again at some point)? Good for you! You won’t regret it. I think it’s better to take baby steps, because figuring out what you want and need is a process in itself. No use overhauling your system and realizing it doesn’t work for you. And congratulations, I pretty sure you have more patterns than I do. (I have oodles of magazines and books, though….) I keep my envelope patterns in shoeboxes (real or clear plastic ones) sorted more or less in categories. Shoeboxes are the right size, but don’t hold a ton. Yes organising. That’s a good idea. Taking over the computer room. Another good idea. Nearly at 500 patterns? Definitely a good idea lol.